The following – which is the walk which we did – covers all the sections in a figure of eight, but you can put together sections A & D or sections B & C to make shorter circular walks. Park just outside the gates of Trooditissa Monastery (which is no longer open to tourists). The GPS co-ordinates for this starting point are: 34.912922N, 32.838289E. Walk through the wooden gates, past the monastery on your left and out the other side onto a clear earthen track. After about 7-8minutes you will reach a junction where there is a bench and a shelter. 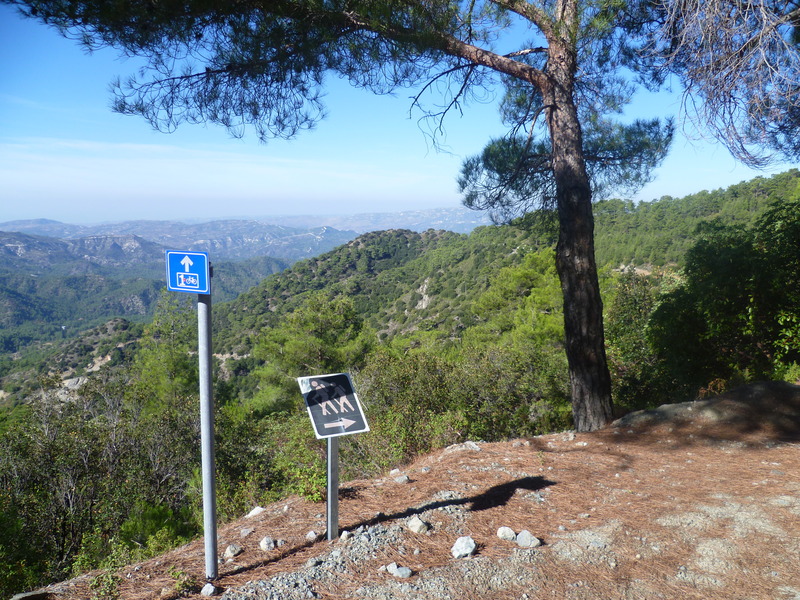 Continue along the track which curves around the mountain offering lovely views down to the village of Foini and – on a clear day – across to Limassol and the south coast. After about 20 minutes you will pass a trail off to your right – this is the return route. Ignore this for now and carry straight along the main trail, following the green hiking sign as shown in the photo below. 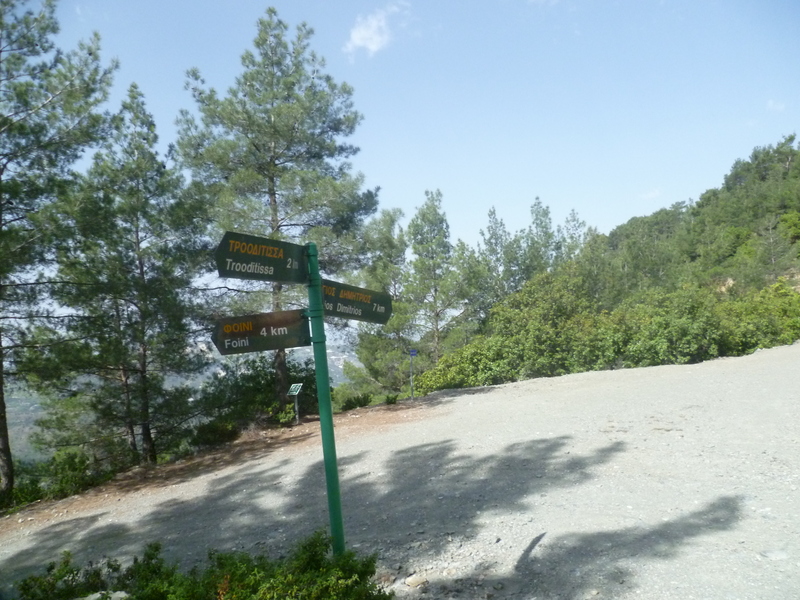 The path now opens out onto panoramic views of the valley below until, after 25 minutes, you arrive at a three-way signpost to Foini 4km, Agios Dimitrios 7km & back to Trooditissa 2km. Follow the route towards Agios Dimitrios. You will be walking on a clear contour-level path through some lovely pine forest. 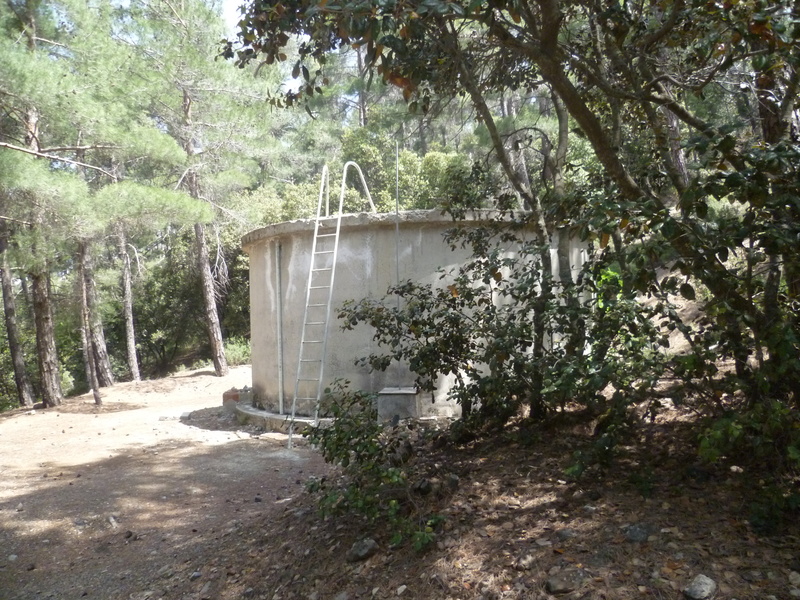 At 50 minutes you reach a clearing where there is a round concrete water tank and a signpost to Agios Dimitrios 5km and to Prodromos 8km. 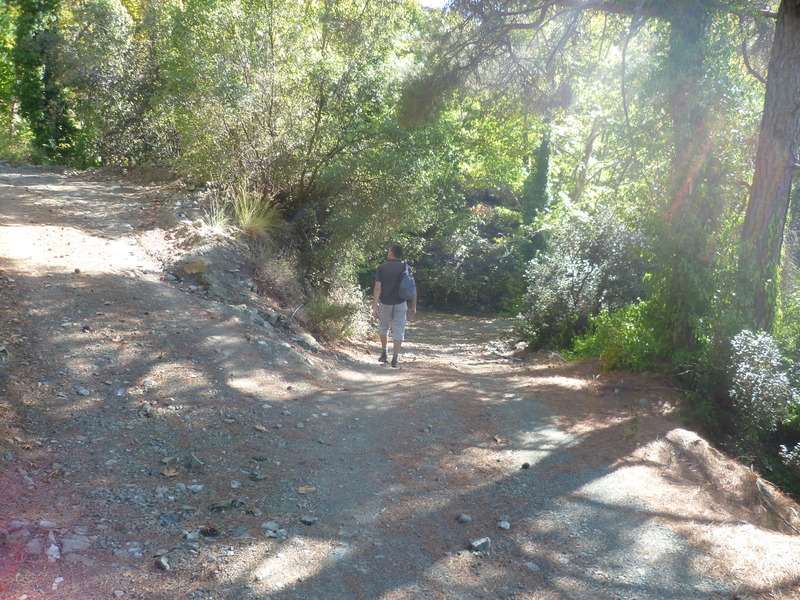 When you are ready to carry on, cross the main road (between Trooditissa and Prodromos) and walk 50 metres downhill to your right, rejoining the E4 path as signposted by the side of the road. You will walk up a track which skirts around the right-hand side of a large concrete water tank. Follow the path uphill for about 7-8 minutes until, at 1 hour 45 minutes, you reach a T-junction with a wide earth track. Turn left here, leaving the E4 route (which heads off to your right). A minute or two later you pass a signpost pointing right to Asprokremmos. 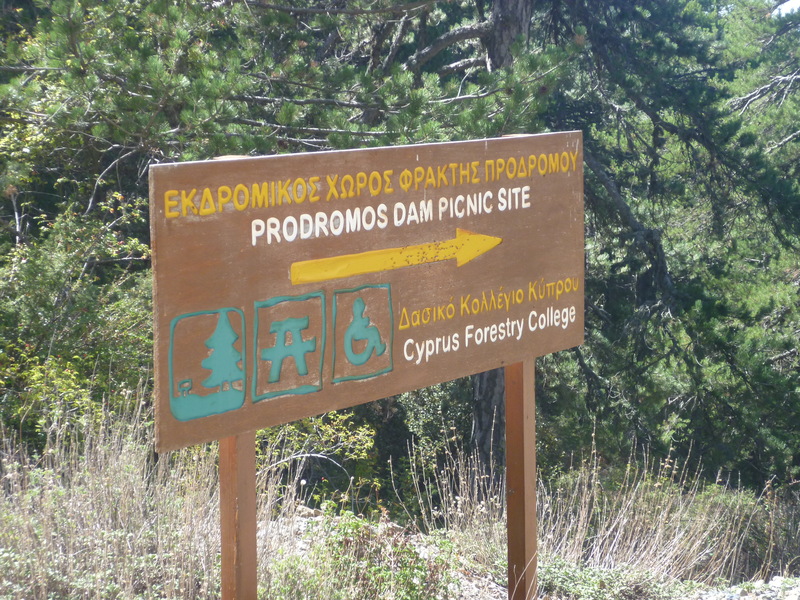 Keep following the trail straight ahead as indicated to ‘Prodromos Dam 4km’. About 7 or 8 minutes later you will come to a fork in the track at approximately 2 hours. 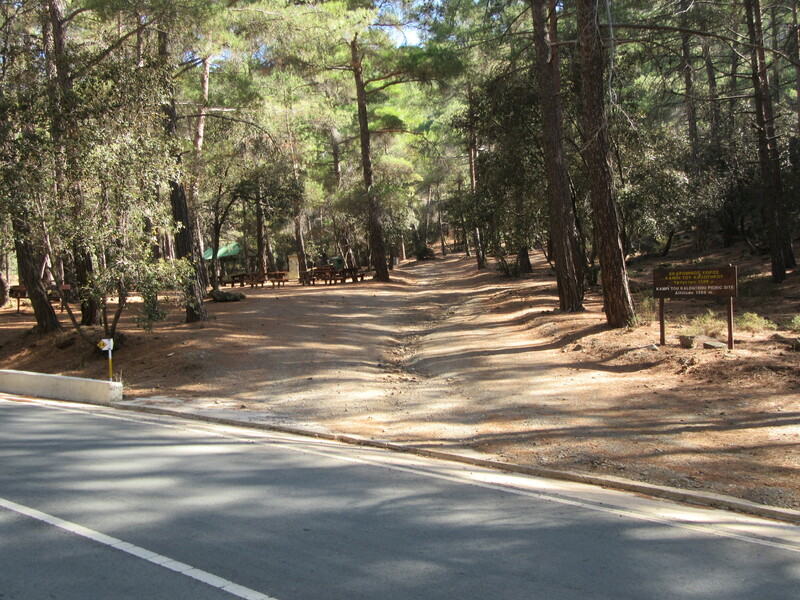 To continue to Prodromos reservoir, take the right hand fork (in the photo above) heading uphill. Keep along this track as it continues to climb steadily through scented pine forest towards the reservoir at 1400m above sea level. 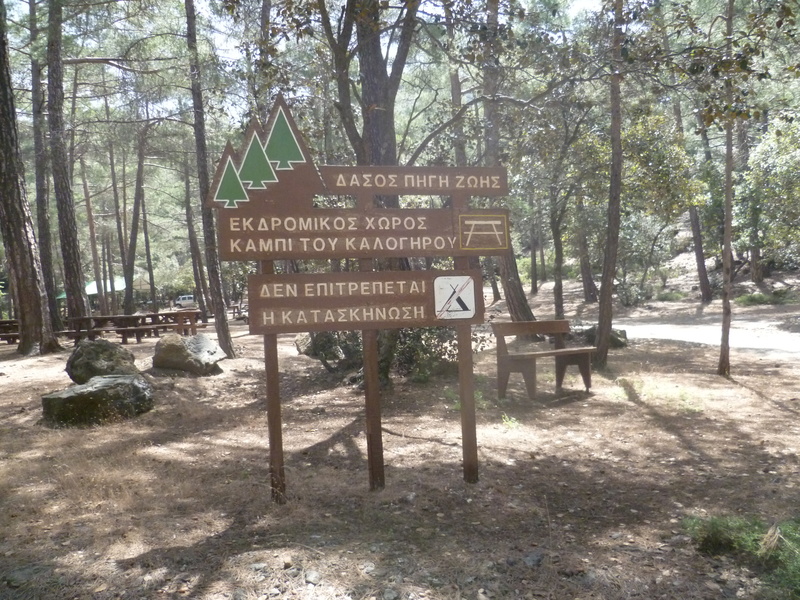 You will reach a junction with a signboard for the picnic site and, following this sign, you’ll arrive some five minutes later at Prodromos reservoir in approximately 2 hours 40 minutes. 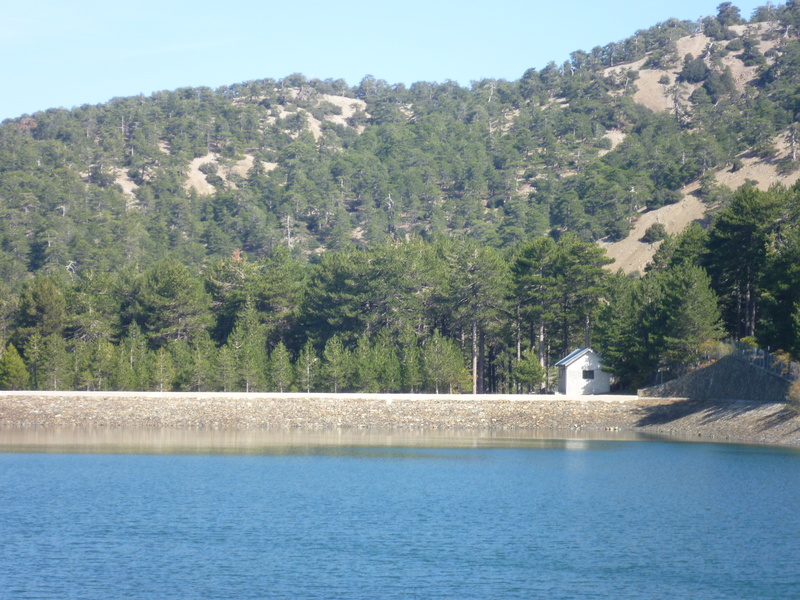 After stopping for a rest at the reservoir you need to make your way to Prodromos itself. The only sure way we have found to do this is to return to the Prodromos dam picnic site signboard (above) and turn left to climb up the hill to the road. This is an asphalt road, it is quite wide and there is plenty of room to walk safely, but there is sometimes a little tourist traffic, so take care. 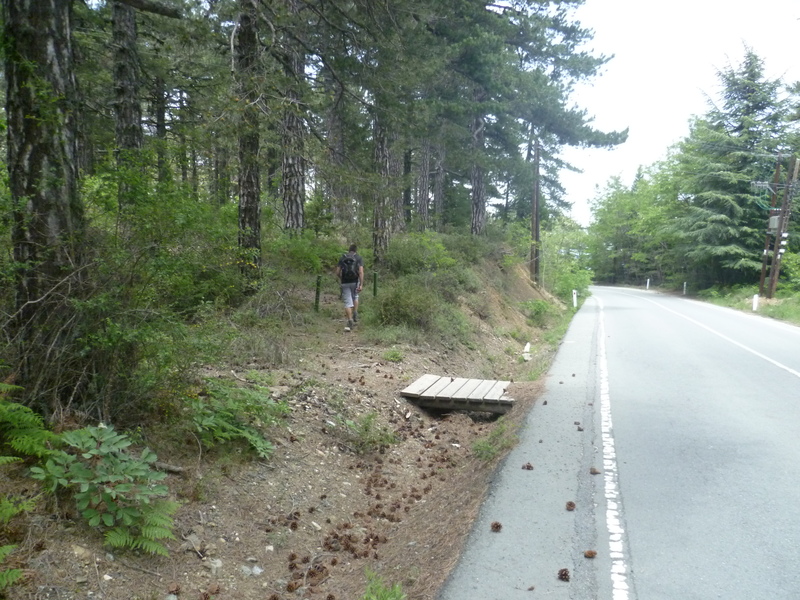 We think there must be a way to get from the dam to Prodromos without walking on the road and as soon as we find it we will update this walk, but meanwhile……. [Update at June 2015/October 2016/May 2018: we have tried walking alongside the reservoir to the deserted hut at the end. There are gates here which are (usually!) open. 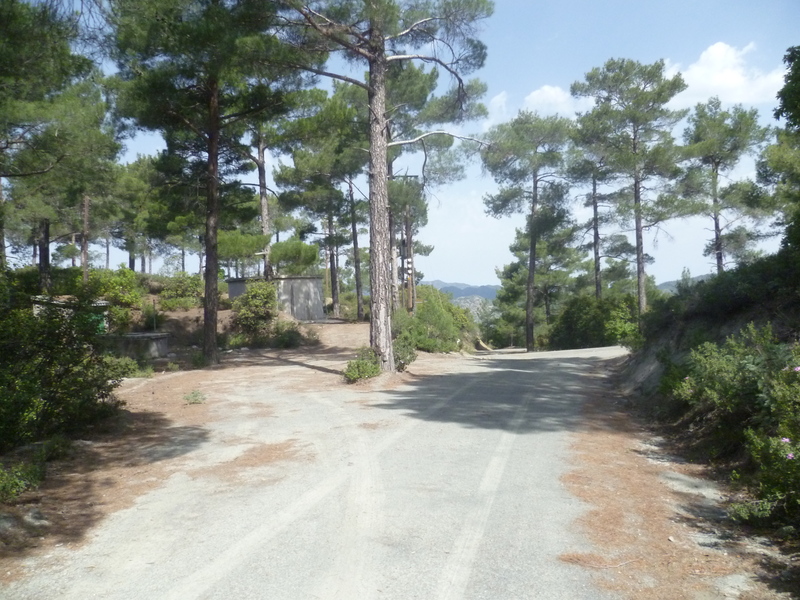 Turn left from the gates heading downhill to Prodromos – this will save some road walking. If you’re looking to rest at this point there is a designated Viewing Point to the left of the road just before you come in to Prodromos. A few yards off the road there is a shelter, a picnic bench and some incredible views down from the mountainside. We usually have lunch here! 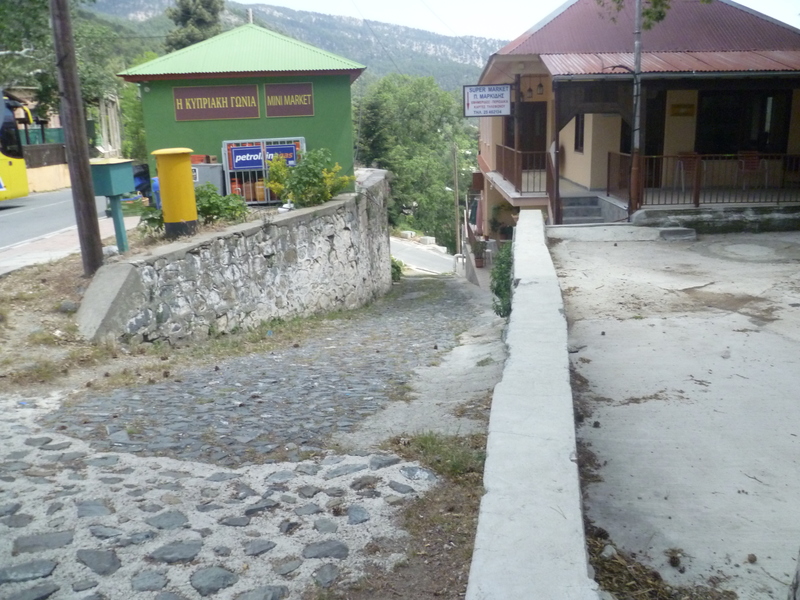 As you enter Prodromos you will see a roundabout near a restaurant and a gift shop. Both are expensive as this is a popular stopping-point for jeep safaris and coach trips. So don’t miss the opportunity to occupy the moral high ground and to feel smug about your healthy hike before you continue on your way. From the roundabout there is a narrow cobbled street leading downhill behind the mini market with a yellow pillar box on the left hand side. Take this street to reach an asphalt road. Cross the road and carry straight on, passing a house with green shutters on your right. This is a concrete and cobblestone road heading steeply downhill. Take the path to the left. After approximately six or seven minutes (3 hours 45 minutes) ignore a left turn next to a deep fissure and continue ahead on the downhill path to the right. Continue along this path, ignoring all side turnings to left and right, to climb back up to the Kambi tou Kalygyrou camp site. (4 hours 25 minutes). This is comparatively easy contour walking with great views across the island to your right. You now need to turn right onto the quiet asphalt road and walk along it for about 10 minutes. 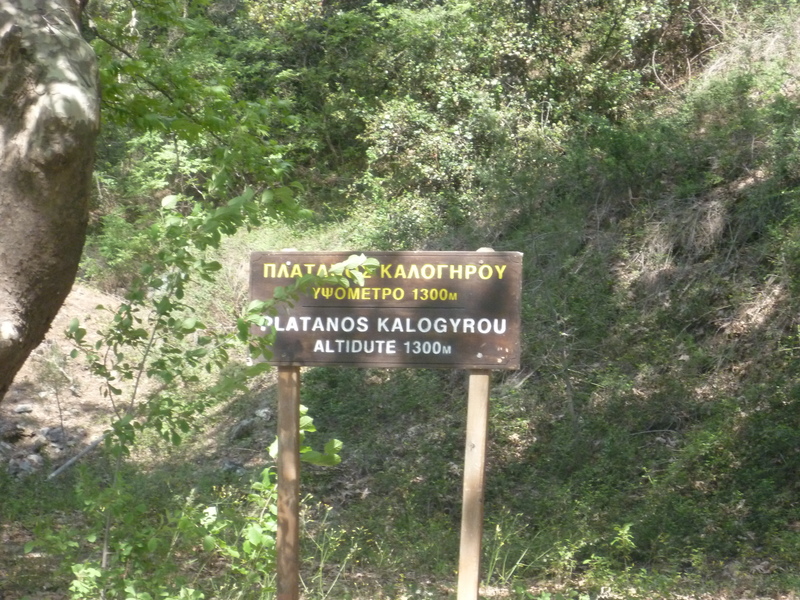 Pass a sign indicating Platanos Kalogyrou on the left of the road. Follow this, heading gradually downhill, until it rejoins the path you took when you left the monastery this morning. (5 hours 15 minutes). This is the point where the green hiking signs are – as in the photo above at the 20 minutes point. Turn left here and climb back to the monastery. Just before you reach Trooditissa you will see a huge sign saying that the road is closed. Ignore this – it means closed to vehicles. As it’s always harder uphill you should be back at your starting point after about 5 hours 40 minutes. 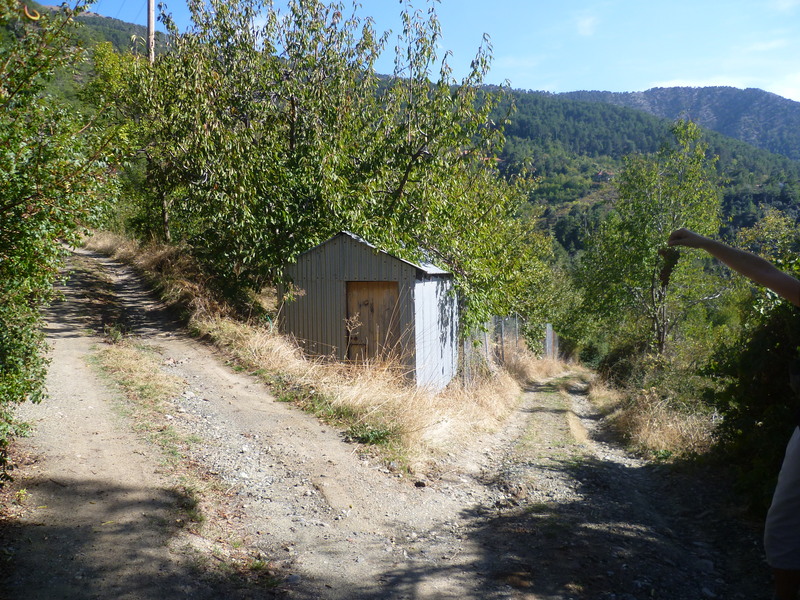 You may be tempted to try to follow a way out of Prodromos which is shown on the CTO maps. 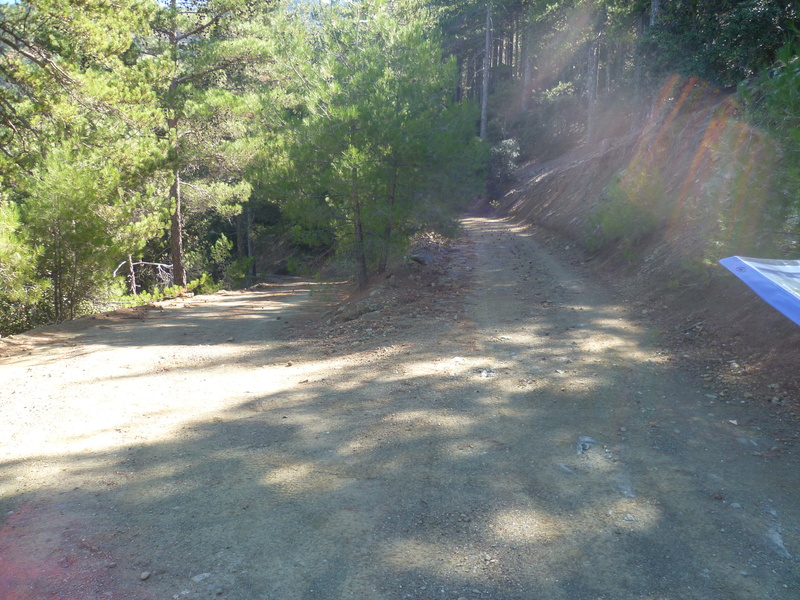 On the CTO map this is the first yellow road right as you leave Prodromos on the red Troodos road. We identified this, and double checked by driving the road later, but it is no longer a through road. You will reach a wooden sign saying No Through Road where someone has built a house across the trail! 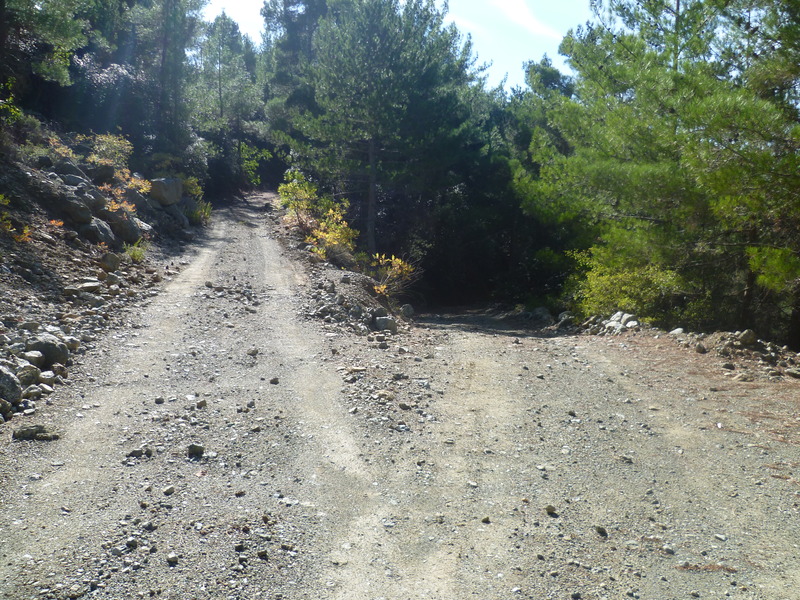 There is another right turn a few hundred metres further along the Troodos road, the second yellow road right on the CTO map. This may be a way back but we haven’t checked it yet. This is just past a notice board on your left announcing Platanos Kalogyrou Alt. 1300m. You can walk along this trail for about 45 minutes to get back to Trooditissa. The walk from Trooditissa taking the road just below the main road at Kambi tou Kalygyrou to Prodromos, retracing this route to return to Kambi tou Kalygyrou, then following the trail back to Trooditissa past Platanos Kalogyrou 1300m will take around 5 hours and is about 12 miles. This timing allows for stops for lunch, map consultations and chatting to monks.